It is the beginning of a new academic year and students are sifting in. Many of them are entirely new to seminary life and they are beginning to register for classes and attend orientation. Among the challenges that Protestant seminarians will face are the fundamentally different impulses at work in the world into which they are about to enter. In the academic world, seminarians will be exposed to an educational system in which the university model of learning dominates, whether the divinity school they attend is affiliated with a university or not. The word “university” is derived from the Latin phrase, universitas magistrorum et scholarium, which roughly translated, means “community of teachers and scholars.” But the world that new seminarians are entering is often more a collection than a community — dominated as seminaries are today by an approach to theological education that masters the subject matter of the discipline as do other modern university faculties — by atomizing and specializing. Faculty members are devoted to the study and mastery of discrete bodies of knowledge. At our own peril, some of us have wide-ranging interests and venture comments on subject matters that lie outside our field of study. We are specialists, and not obliged by our training to make those broader observations. The specialized nature of that educational process has its strengths and advantages. It insures that we familiarize ourselves with a particular discipline. It means that, on balance, we speak with authority on the subject matter to which we have devoted our life’s work. More often than not, it also means that we are active contributors to the body of knowledge associated with a specific field of study. It also means, however, that seminary education moves in a fundamentally different direction than does the task of the pastor, preacher, or priest. Clergy are charged with forming Christians. The tasks they perform (e.g., biblical exegesis, teaching, theological synthesis, preaching, pastoral care) are neither accomplished one at a time nor are they performed in isolation from one another. Instead, clergy apply what they learn in seminary in ways that are synthetic and integrative. A second set of impulses at work in most seminaries is the emphasis placed on learning, and that is certainly appropriate. After all, seminaries are academic institutions. Their work is reviewed by accrediting agencies charged with curricular oversight and the degrees that seminaries award are academic in nature. But people do not attend church simply in order to acquire some diminutive version of the education that their clergy have attained. They attend church in order to encounter God, find sustenance for their faith, and support a community engaged in mission. That is why worship lies at the heart of Christian community, why no rite of passage in the life of the church has greater significance than baptism, and why there is still no word with older historical or theological roots for the task of the church than that of “discipleship.” For that reason, no pastor, preacher, or priest worthy of the title can do his or her work without a relationship with God. To form souls requires soul formation. Spiritual formation is more explicitly a feature of Protestant theological education than it has ever been before in most seminaries. It certainly is where I teach. But unlike the ancient monastic model that weds worship, prayer, community, and learning, it is difficult if not impossible to duplicate that dynamic in the modern Protestant seminary. Seminarians do well to remember, however, that the way in which we pray shapes the way that we think and the way that we think shapes the way that we pray. No minister without a spiritual life can hope to succeed or survive in parish ministry, no seminary can insure that they have one (though they can provide the opportunity), and no church will guarantee that its minister will continue to have one (the church may, in fact, make it much harder). The third pattern that will shape the lives of most Protestant seminarians preparing for ordained ministry will be the differing tasks that seminaries and churches perform. Unlike some contexts in the Roman tradition, those charged with educating seminarians are not the same people who make decisions about their ordination. This division of labor is unavoidable and the division is grounded in the unique purposes of the institutions charged with preparing clergy in the Protestant context. But the difference in roles does require seminarians to serve two masters. On balance, academic institutions require the mastery of subject matter. On balance, churches require that their clergy apply what they have learned to an environment that is radically different from the one in which they mastered the subject. There are people in both settings who are paying attention to the respective demands of each institution and they can be important allies in preparing for a life of ministry. There are clergy who are alert to the academic demands made by seminaries and academicswho are alert to the demands of ordained life. Some have a hand in both worlds and those who do can help. But seminarians do well to remember that their journey does not end with graduation and ordination does not exempt them from rigorous academic preparation. In fact, shifting gears after three or four years of life in the one community can present a completely different set of challenges. The life of a seminarian at a university-based school of theology in the heart of Dallas bears little resemblance to the demands made on the pastor serving a church somewhere west of Abilene, TX. Ecclesiastical and religious communities are no longer the only source of spiritual advice and authority. These sources are now diffuse and decentralized. Americans are increasingly eclectic in their beliefs and selective in their religious and spiritual commitments. Many Americans profess that they are spiritual but not religious, meaning (among other things) that they “do” God, but they do not “do” church. Engagement matters more now than does membership. The environment in which we live is both post-denominational and religiously pluralistic. The vast majority of Americans no longer view the maintenance of the institution as an attractive use of time, nor do they think of it as synonymous with Christian service. I refer to these as “new” dynamics because, in a very real sense, these are old dynamics that have dominated the American spiritual landscape. The high-tide denominationalism of the fifties and sixties was an anomaly in American religious history, not the apex of a development. For that reason, seminarians will serve their communities in an environment much more like the one that has dominated American history. But they are also asserting their influence on our lives in something of a new voice, allied more deeply and explicitly with differences in gender, race, ethnicity, and sexual orientation. Add to that the heady mix of social media that both maximizes change and functions as a new mode of community building and the tenor of that new voice is apparent. I teach a class entitled “Making Sense of the American Spiritual Landscape” and I am working on a book by the same title. At least one colleague describes the effort as “a neat trick, if you can do it.” The book is not devoted to the subject of theological education, but the challenges facing new seminarians prompt me to suggest a template for dealing with both the present and perennial challenges that would-be clergy and their seminaries face. The template involves two poles — one organized on one end around the demands of spiritual formation and on the other around life-long vocational and missional discernment; the other pole is organized on one end around theological grounding and on the other around adaptation to contemporary challenges. The lateral poles of the diagram represent something of the historical and theological challenges that seminarians face: the need to understand the history and the character of their traditions and the challenge of moving into a complex future. Without theological grounding the capacity to adapt to contemporary challenges leads to a rudderless emphasis on relevance, the triumph of technique over substance, marketing over true need, politics and sociology over theology. Conversely, knowledge of theology devoid of the acuity needed to read and respond to historical and cultural changes ends in dead orthodoxy, a message without relevance to anyone but a backward-looking few. Orthodoxy without orthopraxy has nothing living or lively to say, and determining what the leading edge of that effort might be requires analytical skills and attention to the shape of contemporary life. The vertical poles represent the two spiritual tasks that are always at stake in any individual’s ministry and in the life of every Christian community. The first requires constant attention to one’s own formation and the formation of those who belong to the community. The language “the body of Christ” is, by definition, relational, and without that foundation, no clergyperson can hope to foster the same depth of relationship in the communities that they are charged to lead. To journey inward without accountability to the work of God in the world around us is simply narcissism. To journey outward without attention to our own formation insures that we will engage the needs of the world on our own terms and in our own strength. This template does not prejudge what the result will be. Like all good templates of this kind it acknowledges the diversity of the Christian faith, the likelihood that for each seminarian the Christian life takes many different forms, and the certainty that it will look different from seminary to seminary. But it does provide a means of integrating the learning that we do by inviting us to ask ourselves important and integrative questions as we learn. How and where does what I am learning ground me in the Christian tradition? What are the challenges of interpreting that tradition for and applying that tradition to a new day and age? How does what I am learning contribute to my own formation and the likely shape of the way in which I will contribute to the formation of others? When, where, and how is God at work in the world; and, in light of the answer to those questions, what is my vocation and that of my community? At its best and most vibrant these are questions that the church has fruitfully asked itself. They continue to be questions that can serve both seminarians and seminaries as they seek new ways to integrate the education given to our clergy. They also offer one way of thinking about seminary education itself. 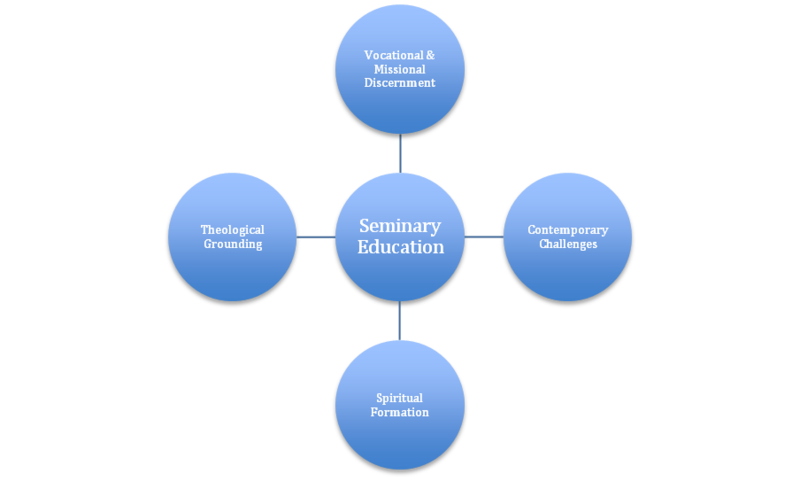 Do the courses offered ground seminarians in the tradition? Does the education seminarians receive equip them to interpret the tradition for a new day and apply it to a situation that is vastly different from the past? Do seminary faculty give explicit attention to the issue of formation across the curriculum? And do those educations equip seminarians to offer a cogent account of where and how God is at work in the world? The university model has contributed to the strengths of contemporary theological education, but historically we have done little to integrate that education in a fashion that complements the integrative efforts of pastor, priest, and minister. To date, the strategy has been simply to add course work in disciplines that are considered “practical.” It is time to explore how asking the four questions outlined above might alter the character of the larger undertaking itself. At Perkins School of Theology, we provide students with a structured introduction to spiritual disciplines throughout the course of the first year. We challenge them to develop their own theology of discernment. At the end of their course of study, the internship program brings them back to those questions. It remains to be seen how such an effort will take shape in each seminary and it will vary depending on the mission that each seminary defines for itself. But every new academic year brings greater challenges. Seminaries, divinity schools, and schools of theology will need to acquire a flexible, imaginative, and lively ability to respond. The near future will inevitably bring change and the schools that lead the way and experiment will be in a far better position to respond, even if some of what they attempt fails. At the same time, seminarians need to remember that regardless of how schools respond, formation and education is primarily the responsibility of the student. There exists a considerable difference of opinion about the best way to approach theological education, and this debate is gaining momentum. But the student’s own level of engagement with the enterprise has been a perennial consideration and it is the one variable that every student can control when the new academic year rolls around.